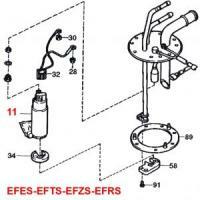 Daihatsu Hijet S100P, S110P Series EFES EFTS EFZS EFRS Engine Series Electric Fuel Pump. Include VIN number when ordering. Genuine Daihatsu Factory Replacement Part. Fuel Pump Only (Item 11) Other items sold separately.